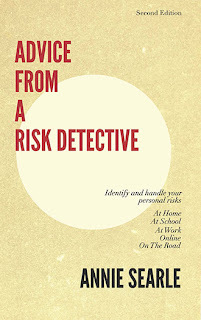 Advice From A Risk Detective: Lighten up your life! Four of the women I most admire -- Cathy Allen, Nancy Bearg, Rita Foley and Jaye Smith -- are the authors of Reboot Your Life, a wonderful book about how to consider your options. In their most recent newsletter the "Sabbatical Sisters" offer these ten ways to lighten up your life. 1. Start by doing a mental scan. What worries you? What isn't worth worrying about because you can't affect the outcome? Throw it away. 2. Do you have a grudge or resentment against someone? Holding that belief creates more stress for you. Forgive that person, let it go, and you will see how much lighter you will feel. 3. There are givers and takers in life. Surround yourself with the givers and friends who give you energy; shed the others and lighten up your load. 4. Lighten up your wardrobe - anything that is too tight, too small, or something you simply haven't worn in two years, give to charity or to a friend who will delight in having something new. 5. Now that you have lightened up your closet, try "packing light" for your next trip. Take just a carry-on bag and you'll find you really didn't need all that extra "stuff" and there are fewer decisions to make when trying to get out the door in the morning. 5. Get rid of all the chachkas in your house that you have collected over the years. You probably don't even remember who gave them to you.It's friendships that count, not objects. Start by cleaning just one drawer or shelf. 6 Cast off any negative thoughts about yourself - too fat, not good looking enough? You are fabulous. Repeat that. You are fabulous. Throw away that old baggage and "Live Light" with the new freer and confident you. 7. Remember "it's all just stuff." What counts in life is people and experiences, not material belongings. 8. When faced with a negative situation - go to the extremes - spend a few minutes imaging the worst and what you might do. You will find that once you do that, you realize that they situation does have a solution, one you most likely won't need to implement. Now you can go back to "living lighter" with less stress. 9 Meditate. Try just five minutes a day, then build up. When your mind is totally in the moment, you are "Living Light". Meditation has been shown to decrease stress and promote health and happiness. 10. If you have not yet completed your "Goals Circles" then do so now. (See our book.) If an activity you're doing doesn't fall in one of your wedges, consider not doing it - you will lighten your load and be more focused on achieving your desired happier and balanced life. " Do you have one minute? 5 minutes?